What does the SBIF Review mean for local biological recording? Almost 10 years ago a petition was submitted to the Scottish Parliament calling for “integrated local and national structures for collecting, analysing and sharing biological data to inform decision-making processes to benefit biodiversity”. This led to the establishment of the Scottish Biodiversity Information Forum (SBIF), and in November 2018 the long-awaited findings of the SBIF Review of wildlife recording in Scotland was published. 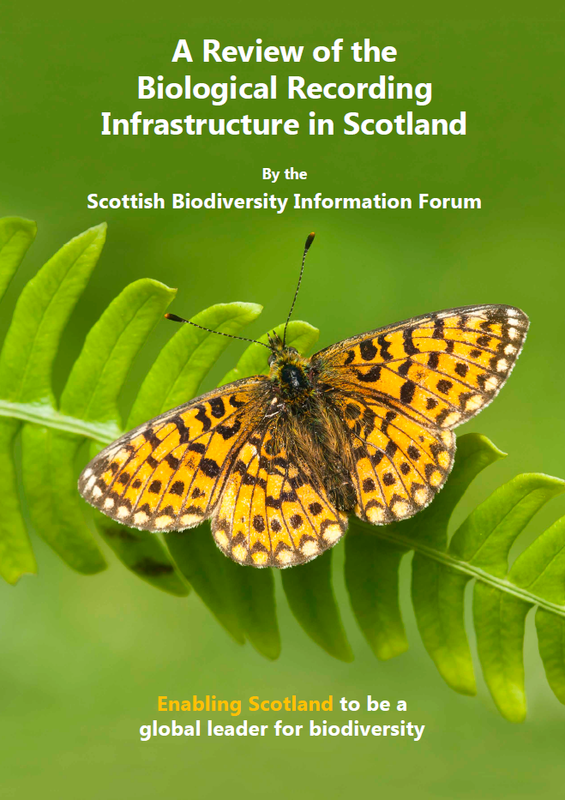 The report ‘A Review of the Biological Recording Infrastructure in Scotland’ is available to download from the SBIF pages on the National Biodiversity Network (NBN) website. The report is 80 pages long and presents a business case to Government for reform of how our biological recording systems operate. There is an executive summary with a list of the recommendations, or you can jump to the recommendations in the main report (pp55-61) for an extended explanation of what these mean. As a detailed business document, it is not an easy read, particularly if you are not closely involved with, or working in, the biological recording sector. So in layman’s terms, what might the proposed transformations mean for local wildlife recording? The Review was a major undertaking. Overseen by an Advisory Group of 16 governmental bodies and NGOs, it has included interviews with 42 organisations, 290 public questionnaire responses, and four workshops attended by 39 organisations. The report is the culmination of seven years of work and sets out a series of recommendations for changes that will lead to significant benefits for recording and our natural environment. The recommendations are grouped into four main themes: changes to the way data moves around from recorders to organisations and to end users (data flows); changes to how the ‘services’ provided by different parts of the infrastructure are delivered (services include many things—provision of ID training and support for recorders, managing and curating data and specimens, delivering data to end users, administration and financial support etc. ); changes to how the organisations within the biological recording sector are managed and organised (governance); and changes to how we fund our transformed network. We shouldn’t forget that these are, at present, just recommendations. They are proposals for the Scottish Government to consider, and it remains to be seen whether these will be adopted wholesale, cherry-picked or cast aside into the long grass. Many of the recommendations focus on improving the flow of data and making the system more simple and efficient. There are a multitude of places that recorders can submit records – direct to local environmental records centres like SWSEIC, online through tools such as iRecord, through national schemes and societies, through smartphone apps and many more. The recommendations look to make management, verification and sharing of data easier and more efficient through providing better data management systems and improving the way that current systems talk to each. This would facilitate easier and faster sharing of information, provide a single place where records can be verified, and enhance the main central data repository, the National Biodiversity Network (NBN) Atlas. The preferred routes for sending in data would be clearly identified, so that recorders would know that submitting records to any affiliated organisation or schemes will result in the data being available for use by all who need it for the benefit of our biodiversity. No need to send data to several different places. The Review also recognises that to make this work we need a new Scottish hub to act as the lead co-ordinating body for Scotland. The NBN would gain a Scottish office and take on that responsibility. It is also suggested that some aspects of the NBN and the Biological Records Centre, who manage large amounts of data for many national schemes and societies, become more closely affiliated at a UK level. Beneath that would sit a network of regional hubs, These will likely evolve from existing local environmental records centres (LERCs) like SWSEIC, and new ones will be created where there are gaps to ensure that all of Scotland is covered and a consistent level of service is available everywhere. Precisely how many such regional hubs there might be would be for future discussion (somewhere between four and ten), but the Review recognises that there is great value in local knowledge and experience, and in being recognised and trusted within the local community. It is likely that some aspects of the work that LERCs currently do will change. There will be less emphasis on managing our own databases since we would be working to feed records into a central data management system, and some of the things we currently do might be handled more efficiently at a national level. But it is recognised that some services will be best delivered by tailoring them to local needs, and also that regional hubs will be best placed to engage local communities in biological recording and to offer training to develop the skills of local wildlife recorders. A significant change is proposed in the way the sector is funded. At present funding for LERCs such as SWSEIC is a mix of national grant funding (from Scottish Natural Heritage), funding from local authorities and from income derived from the provision of services to the commercial sector (developers and environmental consultants). Instead the SBIF Review proposes that the new regional and national hubs are funded from the public purse. This has some advantages and disadvantages (see p25 of the report for consideration of these) but it is the only funding solution that would enable an Open Data approach to accessing data, where access to data would be free at the point of use and no part of the infrastructure would be dependent on earned income from data services to balance their books. The Review recommends that some form of environmental levy be introduced to raise funds to pay for the new infrastructure, so that costs are shared by those who gain value from the network and by those whose activities are key drivers of biodiversity loss. An additional community fund would also be established to support key priorities in wildlife recording, whether that be training to develop taxonomic expertise in key groups, support for surveying under-recorded species/areas, supporting running local recording groups or promoting the public health benefits of recording. To fund such a network adequately will cost significantly more than our present system, and the proposed costings are ambitious, but would potentially deliver some significant benefits. The Review is quite radical and seeks to revolutionise the way biological recording works in Scotland. And to do this will take time. Many of the data systems and organisational structures that will be needed to make this vision work don’t currently exist or will need significant investment to improve their capabilities. The aim is to have a transformed network by 2025, and everyone would work towards this over the coming years – quite an ambitious timescale. But let’s not forget that before any of this can start the Review needs the support of Scottish Government to take it forward. We all await keenly the response of the Government to the proposals to see whether a brighter future lies ahead for biological recording in Scotland.